Fiscal Fraud -- or Frugality? For the past year, Republicans have been criticizing Barack Obama for out of control spending. So they must be pleased that they have forced him, in his State of the Union address, to concede the point by proposing a freeze on outlays of the kind Republicans generally don’t like. Well, not exactly. After the administration floated a plan to cap non-defense, non-security discretionary spending for the next three years, the opposition party erupted in jeers. The complaints were many: It affected only one-eighth of the budget, it came on top of big increases, and the savings would be trivial next to the deficits that are in the pipeline. All the criticisms, as it happens, are true. Obama’s claim of stern fiscal discipline -- “we are prepared to freeze government spending for three years” -- collapsed into comical irrelevance as soon as he listed all the programs that won’t be included: national security, Medicare, Medicaid and Social Security, which happen to be the Four Horsemen of the Fiscal Apocalypse. There’s more: Unspent stimulus funds amounting to $165 billion. Other “mandatory” programs like unemployment and food stamps. Interest on the debt, which will triple in the next three years. Obama is going on a hunger strike, except during mealtimes. His freeze was supposed to save $250 billion over the next decade. But during that period, the federal government had been expected to compile deficits of $9 trillion. The savings would preserve 97 percent of the red ink. Still, it’s odd to hear complaints about excessive spending from the people who brought us the bloated budgets of the Bush years. During his tenure, federal spending did not retreat under the relentless assault of tight-fisted conservatives. In fact, during the Bush administration, total federal spending, adjusted for inflation, climbed by 72 percent. What was originally a fiscal surplus became a deficit, reaching $1.8 trillion in 2009, Bush’s final budget year (to which Obama contributed only a minor amount). Conservatives may justify that record as the obligatory price of the war on terror. But even when you omit defense and interest on the debt, reports Chris Edwards of the libertarian Cato Institute in Washington, Bush was the biggest domestic spender in the White House since Richard Nixon. Not until he had been in office for more than six years did he veto a bill because it cost too much. Bill Clinton may feel your pain, but next to his successor, he looked like Ebenezer Scrooge. 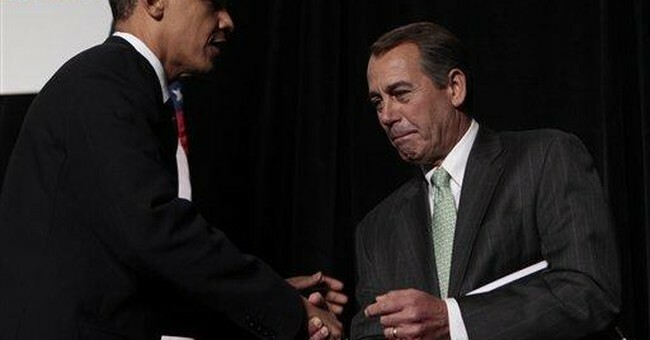 Boehner, far from throwing himself in the path of the spending locomotive, was shoveling coal into the boiler. For him to call someone a spendthrift is like Tiger Woods calling someone a skank. Obama’s plan for this portion of the budget is pitifully modest. But it’s clearly better to cap it than enlarge it, which is what has been done in the recent past. Since 2001, the expenditures subject to the proposed limit have grown from $310 billion to $447 billion. Republicans are making fun of Obama for trying to freeze a type of spending that they helped increase. They should repent, on the ground that since $310 billion was good enough for Clinton, it ought to be good enough for Obama. If the GOP really wants to highlight the administration’s budgetary excesses, the right response is not to merely ridicule how little he offers in the way of savings, but to offer bigger and better savings of their own. Otherwise, they may find that the public disgust with runaway spending can scorch incumbent Republicans as well as incumbent Democrats. There is a shimmering precedent for this approach. After Republicans took control of Congress in 1995, they demanded a plan to balance the budget within seven years. President Clinton didn’t like it, but he was forced to cooperate. Soon the parties were competing in the Tightwad Olympics. Lo and behold, the budget was balanced -- not in seven years but in three. Can Republicans come up with a genuine plan to contain federal spending? Would that move force Obama to get serious about fiscal discipline? There is only one way to find out.